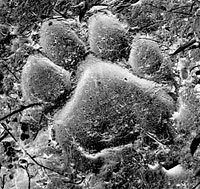 a conference organized by the Union environment ministry on February 12 in the national capital came out with the Tiger Census 2008 and the State of India's Forests Report 2005. Both came out with dismal figures a little more than 1,400 tigers are left in the county; and over 725 sq km of forests have vanished between 2002 and 2004. 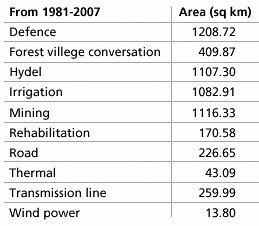 Add to that forestland diverted between 2004 and 2007--over 2,750 sq km according to the Union Ministry of Environment and Forests' data. The common questions conservationists and wildlife experts are asking are where did the forests vanish; where did the tigers go? The census, carried out jointly by the National Tiger Conservation Authority and the Wildlife Institute of India, Dehradun, is being considered the "first scientific assessment" because it used the camera trap method. Wildlife experts say it cannot be compared to the 2001 tiger census. The census was carried out using the pug mark method. It had estimated the number of tigers at 3642; around 1,500 tigers within protected areas and the rest outside such areas. The prime minister-appointed Tiger Task Force in its report in 2005, had called the census unscientific and said that it had overestimated the tiger population (see table Number game). "We had said long ago that tigers are restricted to protected areas," says K Ullas Karanth, director, Centre for Wildlife Studies, Bangalore. Rajesh Gopal, member secretary, National Tiger Conservation Authority, agrees. "The tiger remains threatened within tiger reserves and protected areas," he says. The current survey classified tiger habitats into six regions. Each region had a group of tiger reserves under it. The Central Indian Landcape which includes Kanha, Pench and other reserves, has the potential for sustaining long-term population of tigers, the report said. "Providing connectivity among individual tiger habitats through wildlife corridors and creating inviolate areas and buffer zones surrounding tiger reserves will add to conservation of tigers and other wildlife," says Gopal. The report revealed that tigers and their prey are often poached in reserves where Naxals have a strong presence such as the Indravati reserve in Chhattisgarh and Palamau in Jharkhand. The report said it was important to involve local communities in tiger conservation, especially in buffer and corridor areas. According to Karanth, certain areas have higher population of tigers because prey is available in plenty there. Corbett, for instance, which has 174 tigers. Hence the priority should be to protect the prey and the tiger population by creating inviolate areas; the rest of the measures can follow. The other fallout is that it will affect tigers as well because a lot of tiger habitats are inSchedule v areas. "The maximum loss of dense forest cover has also occured in districts where tigers and tribals share space. The tiger habitat is under threat. People will lose their livelihoods," notes the Tiger Task Force report. The forest survey report says Andaman and Nicobar islands lost more than 175 sq km of their forest to the 2004 tsunami. 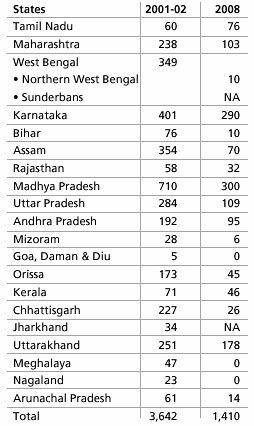 In other states, especially Madhya Pradesh and Chhattisgarh, the loss was primarily because of submergence from dam construction . About 1,191 sq km of moderately dense forest was converted to non-forest. Similarly, about 61 sq km of very dense forest and more than 3,300 sq km of open forest was converted to non-forest. The Union environment ministry has allowed diversion of 11,400 sq km since 1980 (see box Key players in the clearance process). Madhya Pradesh, Maharashtra, Uttar Pradesh, Gujarat and Arunachal Pradesh have seen the highest diversion. Critics say the loss of forest cover would be much higher if plantation and other afforestation programmes were not taken into account. Arunachal Pradesh, Assam, Madhya Pradesh, Maharashtra, Gujarat, Manipur and Andaman and Nicobar Islands witnessed huge forest loss during the assessment period under very dense forest category (with canopy cover of more than 70 per cent). The moderately dense forests, with canopy cover from 40-70 per cent lost over 1,400 sq km. The loss was offset, to an extent, by increase in forest cover in the open forest category--canopy cover from 10-40 per cent. The increase was primarily due to plantations. But, plantations do not ensure ecological viability; monoculture plantations are usually commercially targeted and are of little ecological value, say experts. "If the trend continues, more and more quality forests will get wiped out. The government has tried to show reduced losses through plantation and afforestation activities, which is not comparable to natural forests," says Kohli. Experts also say that states had not utilized funds for undertaking compensatory afforestation in lieu of diversion of forest area for non forest use. Even the plantations raised by forest departments under compensatory afforestation cannot be compared to natural forests, they add. Forest rights activists allege when it comes to industries, the government has huge areas to divert but it overlooks the rights of forest communities. Until 2002, no land was diverted for conversion to revenue villages. In only nine cases, post 2002, forest areas were converted to revenue. "When it comes to giving rights to forest communities, they do not find priority in the moef," says environmentalist Madhu Sarin. "Huge areas are lying with forest departments which are without forest cover and people have been cultivating on those land for centuries, but the government is never keen on diverting such land to give forest communities ownerships; on the other hand huge areas with good quality forest cover has been diverted for mining and other industrial projects," Sarin adds. The Forest Survey of India usually does not analyse forest cover based on their legal status or ownership. In the present assessment, however, it did analyse the changes in recorded forests in three states and one union territory. The report revealed a substantial portion (on an average more than 35 per cent) of forest cover recorded from the states lies outside recorded forest area. For example in Andhra Pradesh, only about 60 per cent of the forest area is under recorded forest cover. "If they have so much area devoid of forests they have better reasons to give it to forest communities," said Sarin.